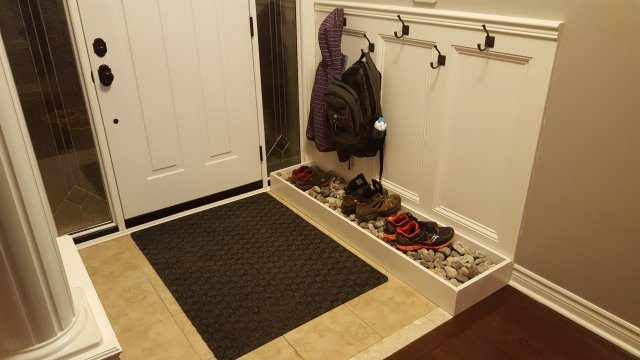 We wanted to add someplace tidy and innovative for our shoes, however. 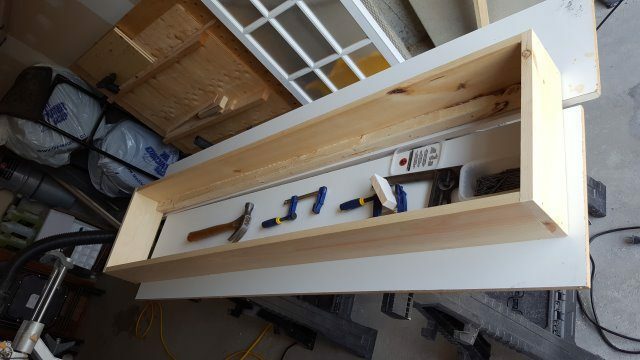 A rack or bench just didn’t have that WOW factor we were looking for…but THIS idea from pinner Lushome sure did. Well, it’s the start of a “wow” anyway. Naturally we took it up another notch. We wanted a fully-built boot bed that not only allowed for great drainage, but also provided some ventilation and drying capacity. The location of this piece in our entryway would put it directly over the heat vent, which normally would be an issue. In our case, we decided to turn it to our advantage! 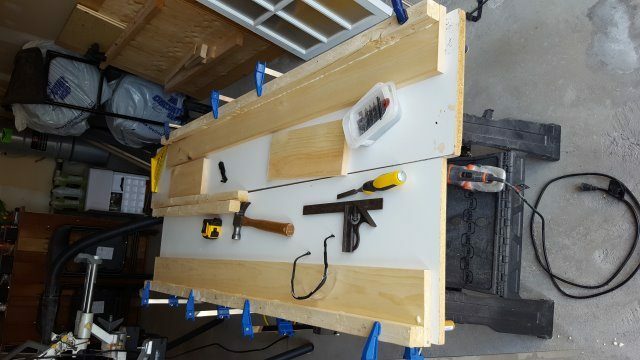 First, we cut the 1×6 boards to length: two for the front and back, and two for the ends, making a simple rectangular box with the short pieces outside the longer pieces. 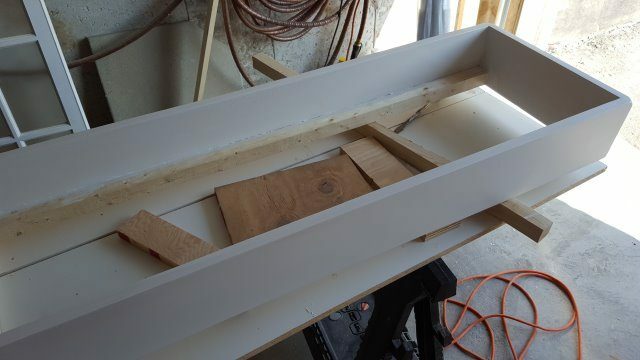 Since this was going to be painted, we just screwed and countersunk the screws from the outside. This was before we had discovered the wonders of pocket hole technology, so future versions may have that instead. We also attached 2x2s to the inside of the long pieces. You want space for air to circulate underneath. After sanding the surfaces to make everything flush, we filled all the cracks, screw holes, and knots with wood filler. Since this is pine, a good filler is necessary for the knots in the wood (more on this later). We then sanded it smooth again. 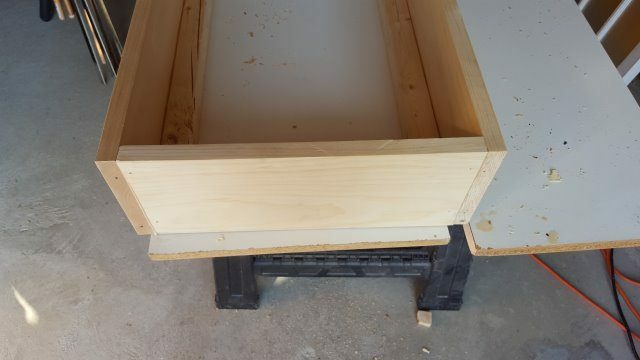 For the bottom, we cut 3/4 plywood to fit inside the the box, resting on the 2×2 cleats. This doesn’t have to be cabinet grade plywood at all. In fact, we used the cheapest, roughest plywood we had…which was off-cuts from previous projects. If you have or want to use new stuff, go for it. Just remember this part is going to be painted and bludgeoned with rocks, so maybe don’t worry too much about a nice surface on the plywood. 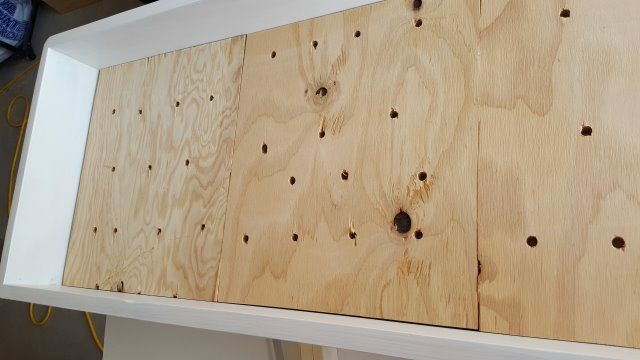 Next, the plywood was glued and screwed into place to make it more or less permanent, and to make sure any water doesn’t seep down between the seams. We took a large drill bit (3/8 to 1/2 an inch) and just drilled a bunch of holes. This doesn’t follow any set pattern. It just needs a lot of holes. 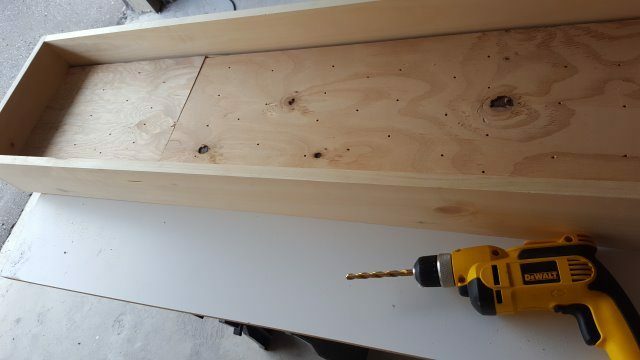 Sand the plywood smooth just to get rid of any splinters from the drilling. Give the entire piece two good coats of primer/sealer — the more waterproof the better. Then paint with regular old latex. We used three coats, just to give it that durability. Finally, we added three coats of Polycrylic on the inside of the box, and two on the outside. This is to make it as moisture resistant as possible. You can seal up the seams with a silicone caulk if you like, but we didn’t bother. We know the inside is going to take a beating over the years, and it wasn’t an expensive project at all. Place the boot bed where you’re going to use it. As we mentioned earlier, this goes right at the foot of our hanging wall where the heat register is. This is, incidentally, why that project didn’t have a baseboard or quarter round applied at the bottom — we knew this piece was going in. The beauty of this is that when the hot air comes through the vent, it actually spreads along the whole bottom of the boot bed and up through the holes, making it the perfect drying solution for a whole family worth of boots, shoes, and gloves all winter long. 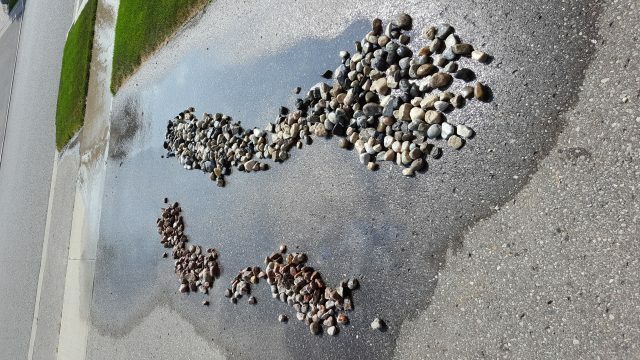 We picked up a few bags of river rock at our local landscaping centre, poured them out on the driveway, and washed them. We made sure to dry them in the sun for a couple of hours, then carried them, a bucket at a time, into the house to dump into the boot bed. 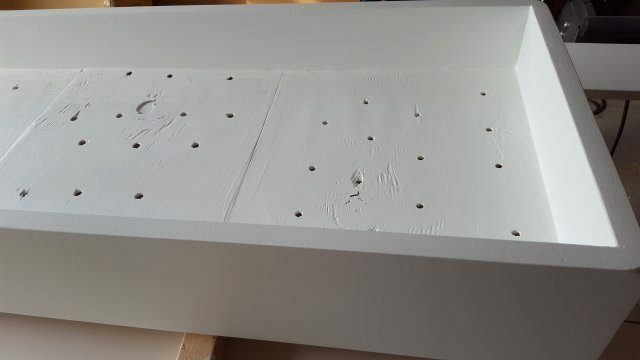 We filled the bed right to the top, making sure the air could still circulate up from the holes in the bottom. The one thing we will say about working with pine for this application: get some shellac to seal the knots. Even after wood filler, spackle, two coats of primer/sealer, three coats of paint, and two coats of Polycrylic, there is a yellow spot forming on the front of the boot bed (after about a year). That’s sap from the knot bleeding through and reacting with all that paint and primer. Shellac would have solved this problem and kept the sap in place. Now we’ll just have to do a touch up next summer. This boot system works incredibly well. Air comes up from the vent, spreads out along the bottom, filters up through the holes, and is diffused by the river rock. From the top, water on the boots and shoes trickles down over the rocks, which makes it spread thinner and dry faster. That means no pooling, no puddles, and very little mess. It’s always a conversation piece when people stop by for the first time, and we’ve had two separate contractors come through (one to adjust the front door, and another to fix a leak in our air conditioner) who have taken photos so they can build their own version at home. 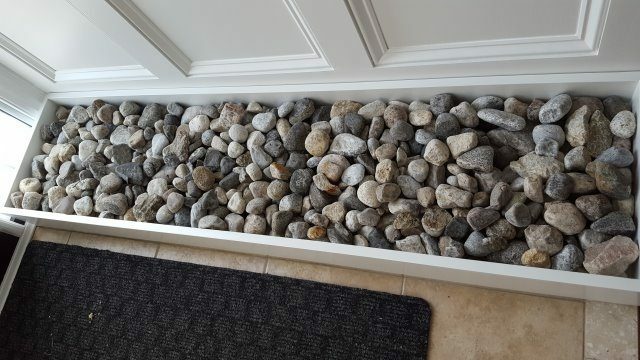 For us, it’s just a great finishing touch for the front entry project. It adds practical storage, reduces the mess, and brings a little nature into the transition space in our home. 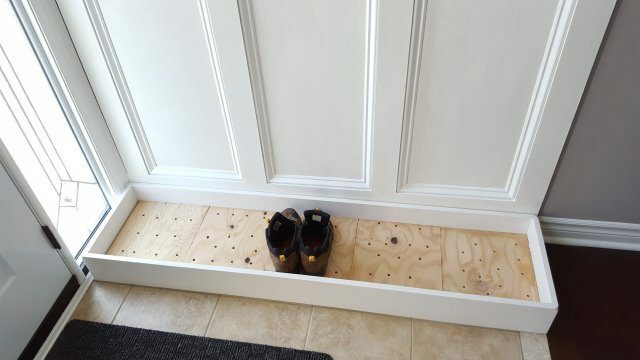 With no mudroom and a lack of great storage on this floor, this turned out to be a really great addition to our grand entrance. 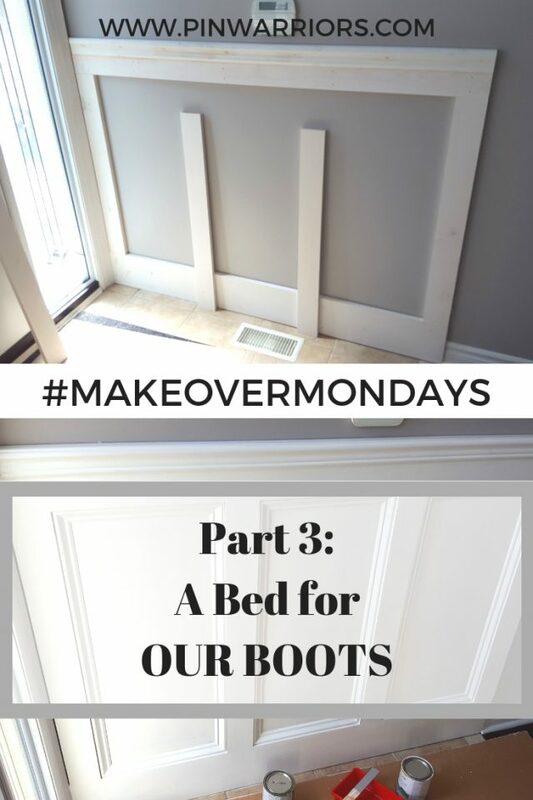 What did you think of this custom boot bed project? Let us know in the comments! 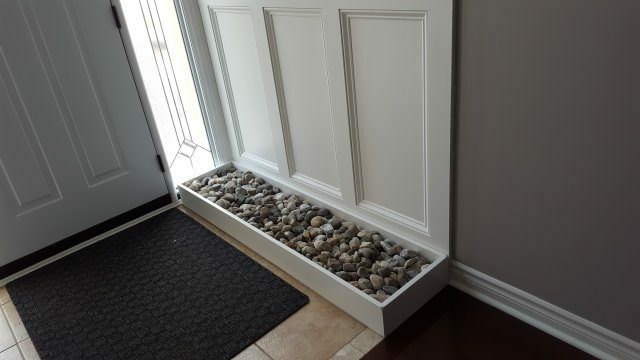 I love this idea with the rocks! It looks fabulous and is very functional! I’ll have to make a smaller one for my entry way! Thanks, Chelsea! It’s a great statement piece and works really well. 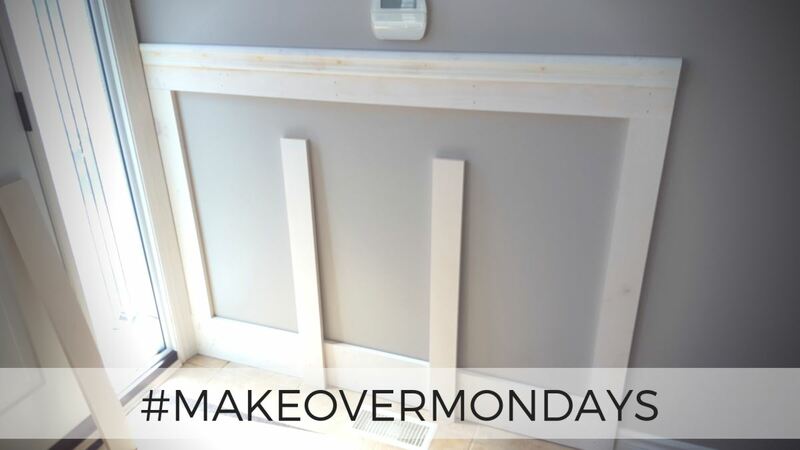 The beauty of DIY is you can make it any size you want. You can also try smaller rocks if the base is going to be smaller as well.